People for the Ethical Treatment of Animals (PETA) runs an animal shelter out of its Virginia headquarters, but the poor dogs and cats that end up there probably would rather go just about anywhere else. According to records on file with the Commonwealth of Virginia, nearly 90 percent of the pets unfortunate enough to end up there never breathe free air again, courtesy of PETA killing them. So if PETA isn’t investing in finding adoptive homes for the unfortunate abandoned pets of its hometown, what is it doing? What it has always done: Vegan propaganda stunts for the goal of “total animal liberation,” the philosophy that (as PETA founder Ingrid Newkirk put it) “a rat is a pig is a dog is a boy.” Over the past week or so, PETA has played its typical sexualization games in Pittsburgh, used Breast Cancer Awareness Month as an excuse to scaremonger against meat and dairy consumption, and seen a complaint by an allegedly less-than-credible source against a hog farm rejected by authorities as baseless. A Pittsburgh suburb finds itself in PETA’s crosshairs over a series of road bollards (pillars) that look like male genitalia. 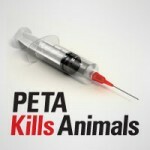 PETA, never failing to capitalize on an opportunity for free, sexualized press to pimp its radical ideology, proposed putting advertisements on the bollards that proclaim veganism the solution for male bedroom performance. We’d suggest that the numerous descendants of omnivores —at least occasional eaters of animal products make up roughly 99% of the U.S. population — prove PETA’s penile press stunt puerile. Not content to take just one bit of medical information out of context, PETA used its most recent McClatchy-Tribune column to claim that women can beat breast cancer by going vegan. There isn’t much evidence to back that claim up, and if PETA really does care about breast cancer treatment, it would be a shift. PETA has taken bold stands on behalf of lab rats used in medical research, including research on potential treatments and cures for breast cancer, and has even encouraged people to not support medical charities that might find cures using animal research.